Spotlight on Developers series, we present a few gadgets that give you new and exciting ways to visualize your data. Our spreadsheet gadgets API is all about giving developers the power to extend the functionality of Google Docs spreadsheets. The following four spreadsheet gadgets display information in unique ways. 1. Tree Map Gadget (By Yaar Schnitman, former Technology Program Manager intern) - A color-coded area diagram that helps you understand complicated hierarchical data at a glance. Required columns: one or more text columns describing a hierarchy of items, and a single numeric column describing the weight of each item. Optional: supply one additional numeric column to create a heat map. 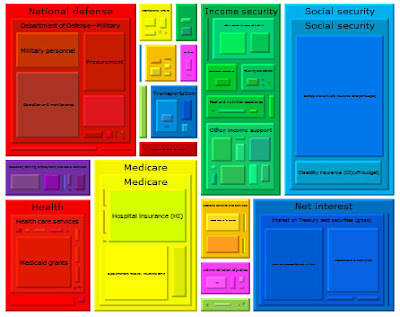 Check out this visualization of the 2008 U.S. budget. 2. Advanced Word Cloud Gadget (by Seth Glickman, former Web Development Intern) - Word clouds are a great way to visualize the popularity of words from large amounts of text, say for example a feedback form, where the more often used words appear in a larger font. With this advanced world cloud gadget, you can customize your word cloud by choosing the color, excluding words of your choosing (like "or" and "the"), and best of all, turn each tag into a link with an easy-to-use search string. Check out a word cloud for Lincoln's Gettysburg Address. 3. Spider Chart Gadget (by Greg Marra, former Software Engineering Intern) - With spider charts you can visually compare the values of multiple attributes. 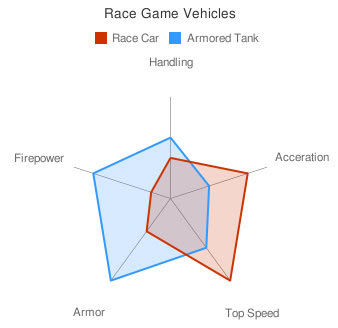 In this example, the handling, acceleration, top speed, firepower and armor of a race car is compared to a tank. 4. QR Code Gadget (by Greg Schechter, former Software Engineering Intern) - Use this gadget to quickly encode data into the QR code format from a Google Docs spreadsheet so that it can be scanned and read by mobile devices that have a QR code reader. An easy way to send web addresses, phone numbers and notes. Try out the QR code gadget. There are two ways to get started using these gadgets. First, you can use the templates above since they already have the gadget inserted within the spreadsheet. Or you can add these gadgets to your own spreadsheet by creating a new spreadsheet and using Insert > Gadgets. There you can check out all of the gadgets that are available. Continuing our Spotlight on Developers series, we present a few gadgets that give you new and exciting ways to visualize your data.